Here are some examples Found. Email Hobo if you have something to add! 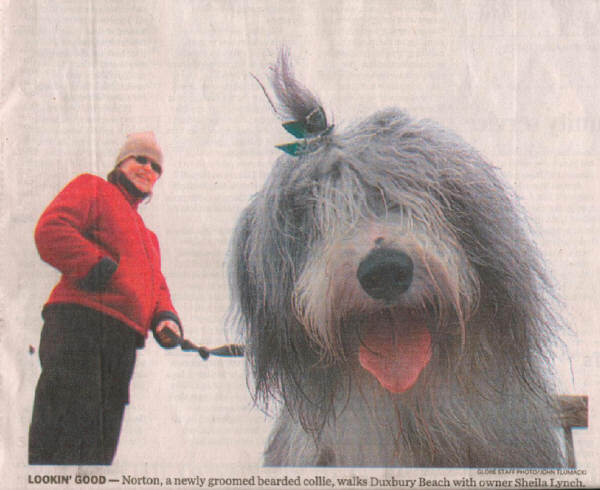 "Norton a newly groomed bearded Collie walks Duxbury beach with owner Sheila Lynch"
Harlan Coben - owns Chloe. 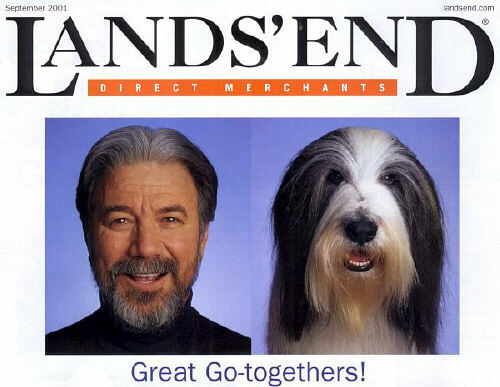 Esperanza's Dog in his Myron Bolitar books, and in TELL NO ONE (June 2001) as Beck's Beardie. America's cutest clue is Chloe. - Winner of the Edgar Award, Shamus Award and Anthony Award. 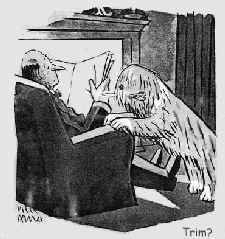 Now you can have your mystery and beardie fiction at the same time. Hobo was delighted when Harlan and Chloe wrote him to tell him of this new page with Chloe's Picture! Saturday October 14, 2000; Waukesha section, Page 1. "After 8 years of separation: Champion Melita Anasazi Madien, Owned by Susan Kennedy of Minneapolis , greets breeder Jean Richland of Riverside Calif. on Friday at the Bearded Collie Club of America National Specialty Show in Oconomowoc." Click here for on image for larger display Nash, and his owner Ansen Hank, at the World Dog Show in Mexico City June 5, 1999. 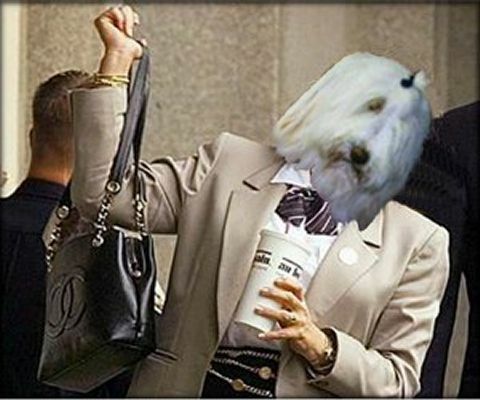 Editor's Note byGeorge is a Bearded Collie who owns Darthe Merrill Jennings FBI Sources today denied emphatically that a Bearded Collie named George has been in a witness protection program. 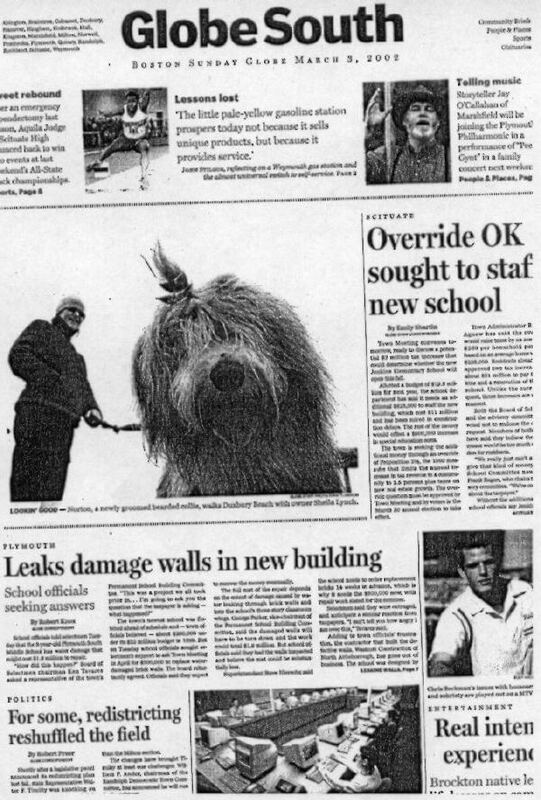 The story hit headlines after reports of the famous Blackwell worse dressed list mistakenly chose Linda Tripp - with reference that she looked like a "Sheepdog in drag". 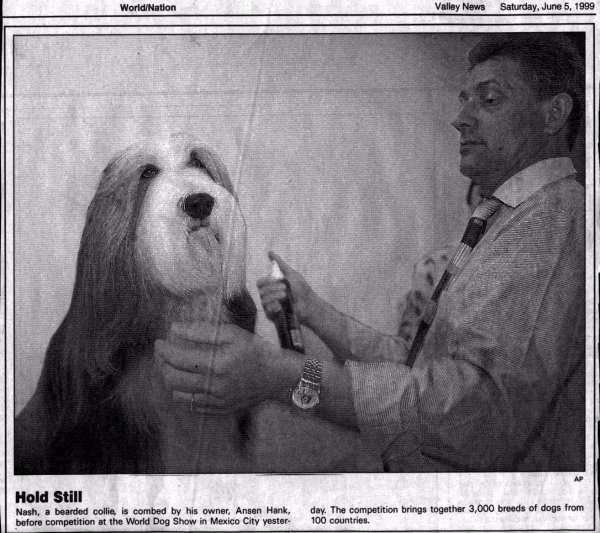 A spokesperson for the FBI went on to say that photos taken by the AP capturing a moment when Tripp was seen without makeup - were mistakenly taken to be an image of some Bearded Collie named George saying "The camera simply picked up a reflection of a weather balloon or something - certainly not a Sheepdog .. or some Beardie named byGeorge"
Click the picture for a larger image (47k) Training and Techniques Can Turn Shy Dog into Adventurous Life-of-the-party Animal. 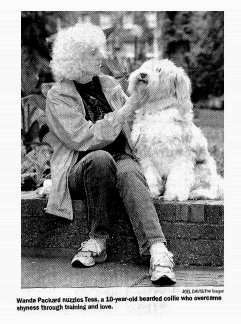 Wanda Packard of Portland Oregon (Milwaukie Or)made a great article in the Tuesday (May 26th) Oregonian. three colomns and 1/2 page spread with photo of Wanda and Tess. 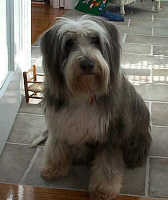 Wanda Packard's dog Tess is an adorable bouncing bearded collie. She's also an accompished obedience competitor. Tess has earned her Companion Dog Excellent title with the AKC. 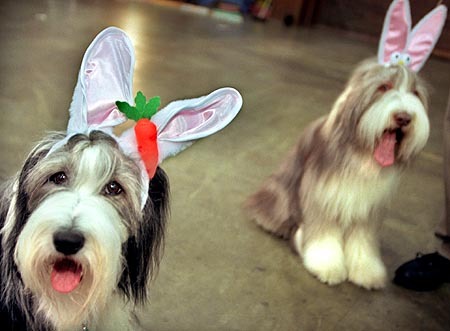 But under the happy go lucky surface Tess like about 20 percent of all dogs is shy and fearful. Whatever your fearful dog's history may be he doesn't have to become a statistic at an animal shelter or live a fearful life behind your backyard fence. 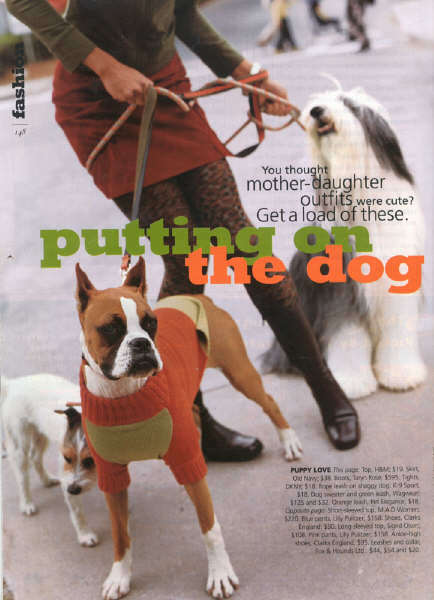 Wanda and the article go on to point out at least nine techniques and steps to help bring the dog along. 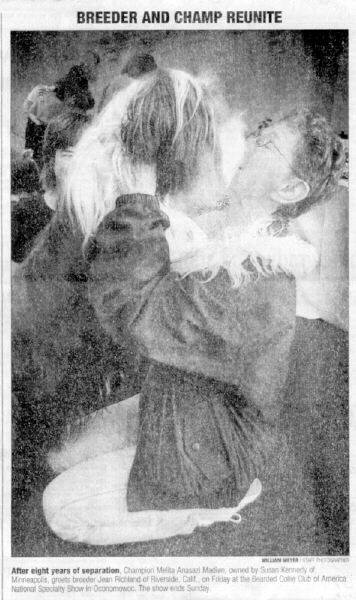 Detroit Kennel Club Show March 7-8 1997, Claudia McNulty and Trent were captured by Detroit Free Press photographer Andrew Johnston for the March 9th Local News section. SEE RALPH LAUREN's BEARDIE picture (actually a mix of unknowns). Note: We try to provide Credit and Links to all stories listed. Permissions obtained or an attempt has been made to obtain permissions. Do not copy these files or any images without permission.